Donut King is Australia’s largest specialty donut and coffee chain, serving millions of donuts every year. Donut King is truly an icon in the retail food market, attracting customers from all ages and walks of life and delighting them with a fun experience and delicious treats and beverages. Donut King offers its customers both young and young at heart a range of mouth-watering donuts (cake and yeast), espresso coffee, hot and cold beverages, signature Quakeshakes, soft serve ice cream and hot dogs – not to mention hot cinnamon donuts cooked to order. 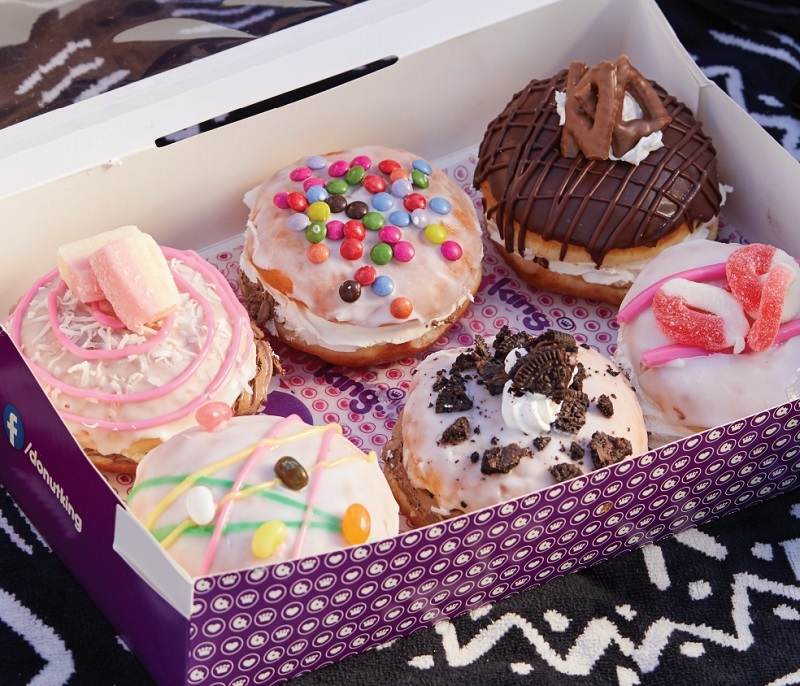 Since opening our first store in 1981, Donut King is considered Australia’s leading donut brand, with 300 stores throughout Australia, New Zealand, Fiji, Papua New Guinea. And we’re still growing. We will launch shortly in Iran, Myanmar, Sweden and with our recent appointment of a UK master franchisor, we will soon be in all major towns and cities across the UK too! 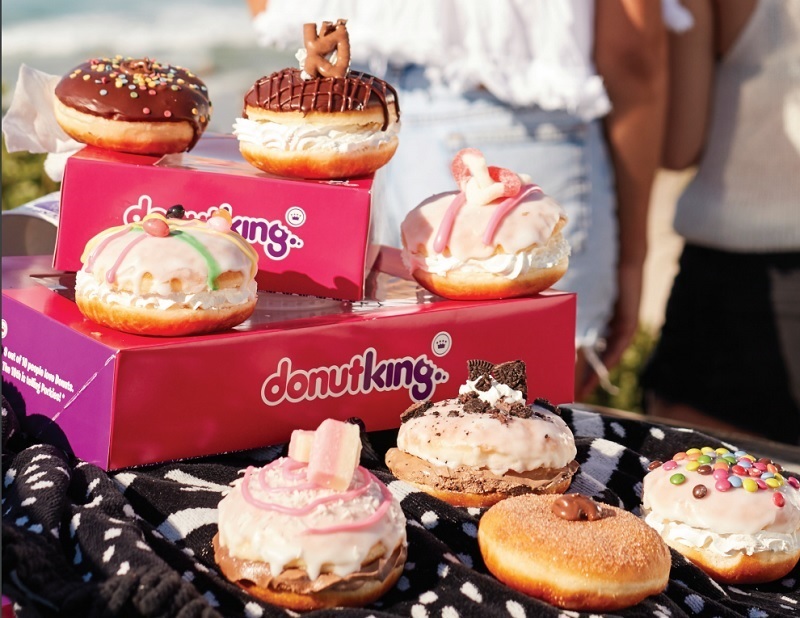 Donut King is a much-loved brand of Retail Food Group (RFG), a global food and beverage company headquartered in Australia, with a regional presence in Los Angeles, USA. Perfected over 25 years of operation, RFG now has a strong portfolio of world-class franchise systems - Crust Gourmet Pizza Bar, Gloria Jean’s Coffees, Donut King, Brumby’s Bakery, Cafe2U, Michel’s Patisserie, It’s A Grind, The Coffee Guy, Pizza Capers - with an extensive global footprint of over 2,500 outlets in over 80 international licensed territories. RFG is Australia’s largest multi-brand retail food franchise operator. “I am excited to join the RFG family and am confident that Donut King will be well received in the UK. RFG and its Brand Systems have a great reputation, a quality product offering, and fantastic benefits for Franchise Partners and | look forward to working with the Company and introducing locals to donuts like they've never experienced. 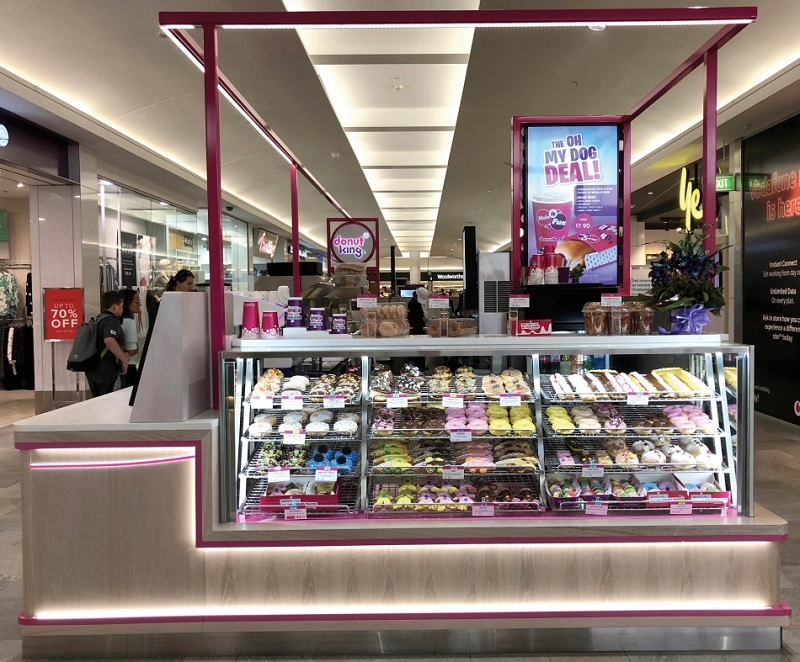 Donut King stores are predominately a take-away experience with our kiosks and larger stores containing a small seating area. There is a minimum of three store designs available to develop the Donut King brand in your territory. Donut King stores are generally located in large shopping centres and smaller busy local shopping centres. As a business package, Donut King provides all support systems, marketing, operations manuals and training along with ongoing field advice and coaching to assist our franchise owners. We have a partnership with Franchise Finance who can assist with the financial needs of prospective Franchisees. Support network: You are in business for yourself, but not by yourself. Nobody works alone. Franchise Partners are given the key resources and ongoing support required to run a successful business. Proven system: A business model that is proven to work for others can give you the confidence that it can also work for you. Donut King is an established brand with over 300 stores. By following the system outlined by your franchisor, your new business benefits from the experience of an established enterprise. Finance: Banks are more likely to provide funding for a recognised franchise business like ours than a new start-up. Multiple franchises can even help you secure funding. Marketing: We will provide you with a promotional calendar and all key marketing tools so that your key focus is running your store successfully. Training: We will provide you with full training on how to run and manage your store. Location: It is vitally important to ensure that the location for a business is the right one. We can assist you in sourcing suitable premises at the best rates possible. Purchasing power: All key ingredients are ordered via the Franchisor, thus increasing the buying power of the network. By filling in the form below you will be able to download a copy of the Donut King prospectus.